Have you had a chance to explore some of the blogs included in the Social Flooring Index? In case you haven't, let me help. You'll find quite a few gems from which to learn starting with Formica's Share The Love Blog, a new addition to the November 2011 update to the Social Flooring Index. 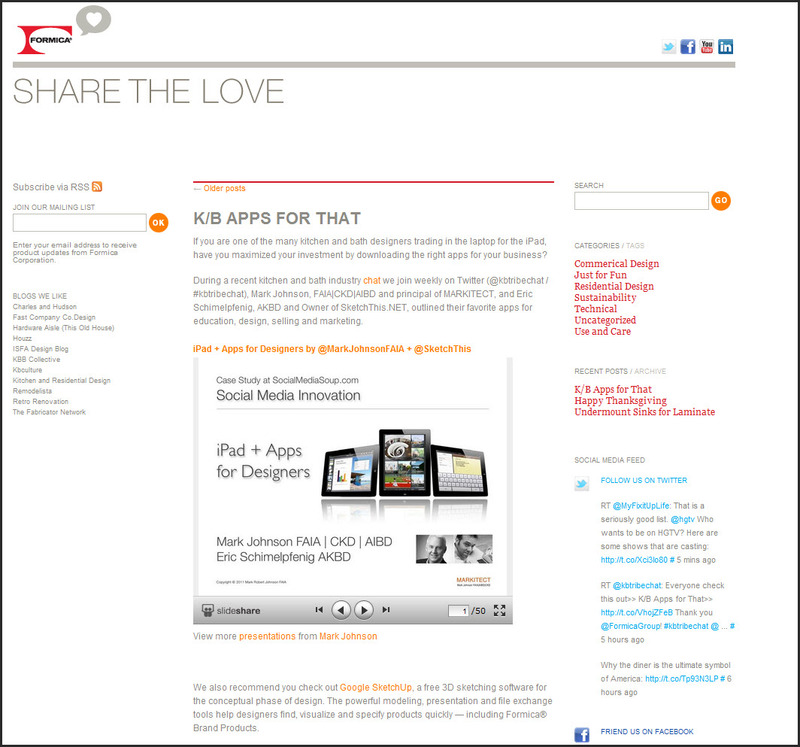 The Formica Share the Love Blog was launched on April 18, 2011. It publishes approximately two blog articles per week in categories ranging from Commercial Design, Just for Fun, Residential Design, Sustainability, Technical, Uncategorized and Use and Care. The visuals are delicious capturing the latest in runway show inspirations and design ideas from around the world. [In Formica Fashion, you'll find Formica shoes?] The individual articles feature links to sources outside of Formica.com for deeper perspective on specific topics. A reader can definitely have fun. You'll also find in the sidebar recent Tweets [Formica has an active Twitter profile with over 1,600 followers] and Facebook updates [Formica has an active Facebook Fan page, too, with over 1000 fans]. In other words, Formica is engaged socially. Add more content to blog articles. Many are approximately 100 words in length. Make them consistently longer. Aim for ~ 300 words. Include more detail in About the Blog about the members of the marketing and PR team maintaining the account. Identify them. Include photos. Detail who writes which blog articles. Include initials in Facebook and Twitter updates. Allow readers to connect with the human beings representing the brand. Great Job Sharing the Love, Formica! I look forward to reading more. What do you like most about the Formica Share the Love Blog? Let me know in the comments.